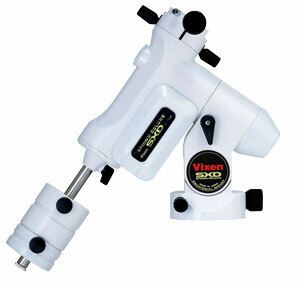 The Vixen SXD mount comes with Star Book GO-TO controller for manual or computer controlled observation or astrophotography. A ‘deluxe’ version of the SX mount platform, the SXD is based around the same compact, lightweight design of the SX. To provide even higher levels of stability and tracking accuracy, it utilises high grade materials throughout the mount head. The SXD has a higher payload capacity than the SX at 15kg (33lb). The mount has high quality bearings on the RA and DEC axes to reduce load on the motors and to make the motion of the axes as smooth as possible. When the mount is well-aligned and used in conjunction with a third party autoguider, it offers exceptional tracking performance with the heaviest of astro imaging payloads. The high grade steel chassis provides stable and accurate RA and DEC axes. The placement of the motors in the lower part of the mount casing allows them to form part of the counterweight package, reducing the need to add additional counterweights to balance the scope. The machined brass worm gears allow smooth movement through the whole 360° motion of the mount. Combined with the trainable PEC feature in the Star Book controller, the SXD offers the keen amateur astrophotographer the perfect platform for long exposure imaging. An internal polar axis scope is supplied as standard, mounted in the RA body. A variable intensity illuminator is pre-installed in the mount to evenly illuminate the alignment reticle in the polar axis scope. Vixen’s excellent reticle design and precise RA axis/polar scope alignment makes precision polar alignment quick and simple. Please call for information regarding spares and accessories.